Diabetes could be a large concern in the aftermath of a large-scale disaster event; especially if nutritional needs are not met. 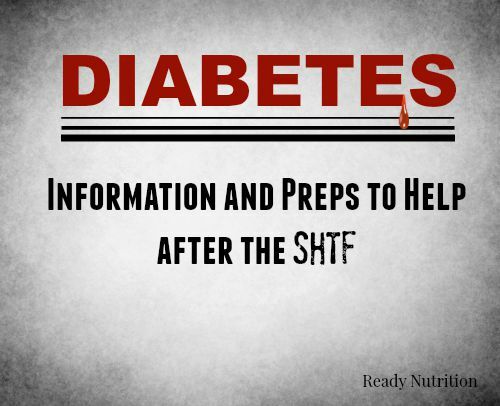 Hey there, guys and gals, and welcome to another prepper-medical information installment of Ready Nutrition to help you in your quest for information and supplies before the SHTF. Diabetes is an important thing to speak about, as the disease will be even more pronounced when nutritional requirements are not met. In addition, what is a diabetic to do after the “Mad Max” scenario ensues? Let’s learn a little about the disease, how it is treated by the physician, and some holistic measures that can be taken when the time arises after a societal collapse and the looting of the pharmacies has happened. We will cover some information pertaining to Diabetes Type II in this article. The information presented herein is strictly for informational purposes only and is not meant to diagnose, treat, or prescribe any condition or action for anyone. Only a qualified, licensed, certified, approved physician can do such. Prior to taking any actions or utilizing any information presented, discuss it with your family doctor. First and foremost, some basics about diabetes and its different types must be perused, especially Types I and II. Diabetes mellitus is defined as a “chronic metabolic disorder marked by hyperglycemia. Diabetes mellitus (DM) results either from failure of the pancreas to produce insulin (type 1 DM) or from insulin resistance, with inadequate insulin secretion to sustain normal metabolism (type 2 DM).” Whew, that was a long one! Chances are, though, if you have been diagnosed with either type, you already know most of what we’ll cover, so be patient until “the rest of the class” catches up. Hyperglycemia is our main culprit here, the key prefix being “hyper,” Greek for “over” or “very high,” (as opposed to the antonymic “hypo,” meaning “lower/shortage”). Glycemia relates to sugar; therefore, it can be seen that hyperglycemia is an overly high supply of sugar in the body that leads to problems with its metabolism. Digestion is the process by which foods are broken down into their basic structural components and absorbed and transported where the body needs them. Glycolysis, glycogenesis, and the glucose cycle (very involved processes) all have to do with the breakdown of fats, carbohydrates and complex sugars into simple sugars (glucose) readily absorbable for use by the human body. Diabetes (in general) presents several problems regarding homeostatic balance. Firstly, it is marked by excessive urination. Types such as Diabetes insipidus, for example, present with massive amounts of daily urination (2-5 gallons/5-10 liters per day) that throw off all fluid electrolyte levels and can lead to death by dehydration. Secondly is the problem of production of insulin by the pancreas. Insulin controls metabolism (not just of sugars, but of protein and fat uptake). Type I diabetic patients do not produce enough insulin on their own to survive. Type II diabetic patients usually experience an inability to control their blood sugar through diet, exercise, and oral medication. Its onset usually occurs later in life or with illness or injury (these latter two affecting or compromising the body’s ability to produce insulin in sufficient quantities). Veterans who have come into contact with Agent Orange (a defoliant used in the Vietnam War) may attribute it to their Type II diabetes. Let us be frank: such a problem is beyond the scope of laymen and non-physicians to address except to explain. Even then, limitations are imposed because of the sheer number of variables per individual as to preclude actions except on a case-by-case basis. So what can we do here? Firstly, reiterate what has already been mentioned in articles past: your doctor and hospital with lab facilities and testing methods are critical for you to determine whether or not you are afflicted with Type II diabetes. Secondly, “An ounce of prevention is worth a pound of cure,” should be one of your “watchword sayings.” If something seems wrong, it probably is wrong. Common sense and the ability to gauge changes in your own body are not hypochondria; they are the signs of taking control of a situation before it takes control over you. Changes to look out for are nervousness or restlessness, disturbances and changes in your vision (this is a major sign/symptom), abnormal (unattributed) rises in your urine output, headaches, orthostatic hypotension (when, for example, you feel faint when moving from a supine position on the couch to standing up), and general malaise/unwell feelings you don’t normally experience. You also need to monitor your food intake and see what the results are. Do you normally eat a lot of sweets, and all of a sudden you are experiencing problems? The doctor will be asking these questions. You can help out by having that information detailed and readily available in writing: include meals, when they were taken, the amounts, and the effects you felt. There are several herbal foods that may help those suffering with Type II Diabetes. Fenugreek (Trigonella foenum-graecum) is a hypoglycemic herb that has reduced urine sugar levels by 50%. Fenugreek can be taken as capsules, tinctures or decoctions of seeds. Pregnant women must avoid it, as it is a uterine stimulant. Bilberry (Vaccinium myrtillus) is also a hypoglycemic and it increases insulin production. The leaves are the primary source for help with the diabetes; leaf infusion can be taken as an adjunct to control it. The first two foods are available in health food stores, on Amazon or in your friendly neighborhood Wal-Mart. As with all things, pay attention to the instructions on the label. A good thing they may be used for: as an adjunct to your emergency kit should supplies of insulin or medication be interrupted (such as by hurricane, shortage, etc). Remember to plan your work and work your plan. Coordinate with your physician and ask about measures to prolong storage of refrigerated insulin, as well as any medications to help you that will not require refrigeration. Be safe and help one another, and continue to prep!